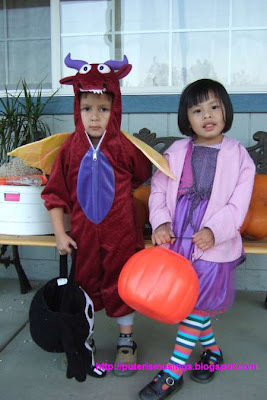 My friend, Kathy, convinced me to get costumes for the kids. So late this morning, I went to Walmart and got them these two costumes. Duncan wanted a Superman costume but there wasn't any left. 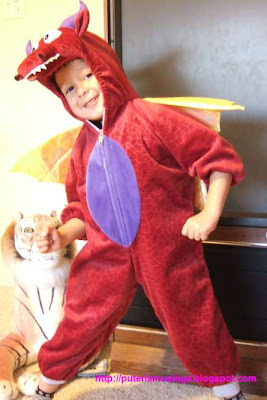 So instead I got him this dragon costume. 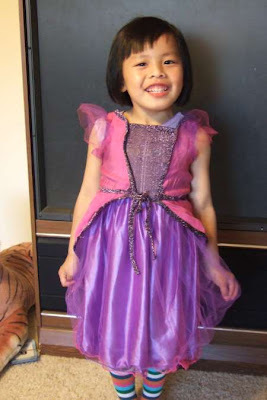 And I got Denice a simple princess outfit. Grr! I am a fierce dragon! Heheh. Look at me, I am a pretty princess. She complained that the dress was scratchy so I made her wear a shirt dress underneath it and tights because it was a bit cool outside. The dragon and the Princess. All set to go to the Harvest Festival. Our church organizes this Harvest Festival open to the public every year. Instead of the kids running around the neighborhood going trick or treating, they can gather in one safe place and enjoy free burgers, corn dog, drinks, funnel cake, fries, and lots of games and candy. There were also free rides - pony rides, hay rides, petting zoo, tea cup ride and a merry go round. There were also raffles, and you don't have to pay to enter any of these raffles. The prizes were some pretty hampers. So cute ...both of them looks great. Surprise can still get such good ones ..on the eve or the day of haloween. Not a lot of choices lah. Even Duncan's costume is a little short for him. The next size up was a little too long. More pictures coming soon! On one of my other blogs! 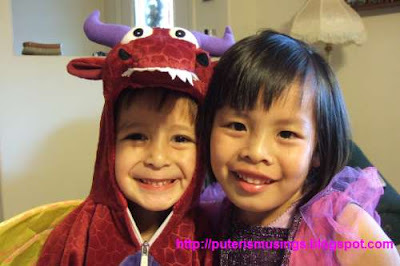 waduhhhhhhhhhhhhh they are soooo cute!!!! Thanks Chantique! Ukai saduai aja mina cute malam nya. Rindu endar meda bala anak mit ngena costume sida. alass!! d parents got no costumes!!!! Coki, issh, kiroh bepasang ka costume! Enggai masau duit! Heheh. Mac, thanks! Rindu endar saduai masang costume saduai nya.